3D Fun with a FREE PDF! Hello and Happy Sunday! If you live on the east coast I say…..BUNDLE UP as we are going down into a brrrrr DEEP FREEZE! We fortunately missed a projected storm but Old Man Winter is here in FULL SWING with high winds and frigate temperatures! You know what happens on Randall Lane when the weather is like this….I have one GRUMPY PIGGY….yep, Daisey is NOT a fan of this weather! It will pass and we can just think of Spring around the corner! I wish you could all hear her making grunting noises with each step she takes….I swear she says…I do not want to go out…I do not want to go out!!! She does make me laugh and she does bring me joy! I think that this little project that I have for you today will make you smile and THINK SPRING with these fun butterflies! 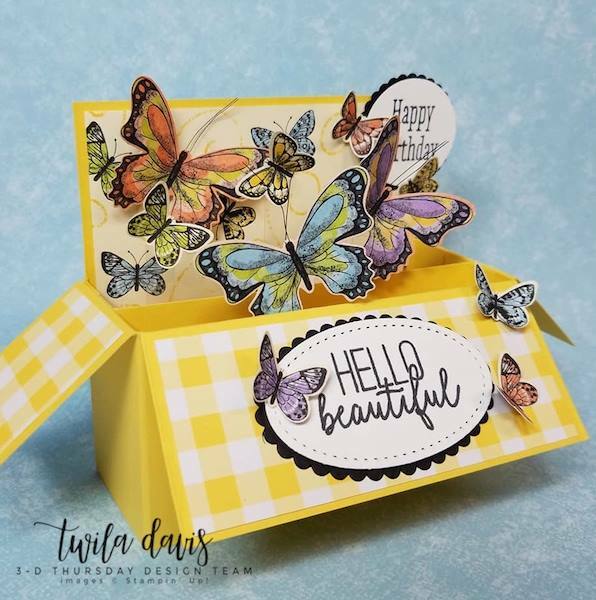 Welcome to the 3D Thursday Project this week…a bit late but I will say that Twila Davis from Stamp A Little Longer really…really nailed it this week! I was determined to make this myself so I can enjoy Twila’s great directions and also make a spin on it for myself! Please enjoy what Twila has worked up for us…and then I hope that you will see what I did! If you purchase this bundle, the Butterfly Gala from me… I will send you the contains for you to put this together for yourself! 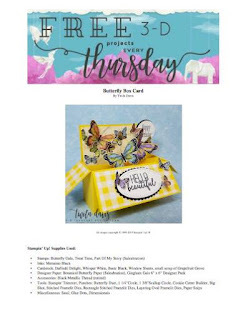 This bundle includes a punch and we all know how the ease of a punch is to us when we craft….just the BEST but please make sure that you add other products to hit that $50.00 mark so you can earn this beautiful DSP for FREE as the punch from this bundle….punches the butterflies out – how wonderful is that!!! The great thing about a project like this is that you can easily fold it down and it will fit into a regular size envelope. 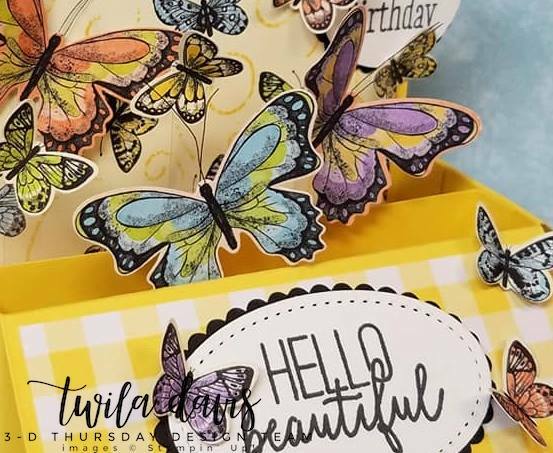 In my example, I did put the top butterfly up too high for it to fit into an envelope…..so a heads up…..when you are putting it together and IF you want to mail it is a regular envelope…..just make sure that you do not put it too high! I love the sentiment that Twila did in her box…that sentiment is the best! I chose to put another piece of the DSP that I used and just adhered it on 3 sides so I could tuck in a mini note to the recipient! Really, the sky is the limit with the fun you can have! Next, you will see more pictures of what I did with Twila’s inspiration and also the products that I used! At the very bottom of this post you will find the FREE PDF for you to print off and make one yourself! I warn you, they are addicting to make and you will quickly find many stamps that you have that you could use…..just shop that stash! I used the sentiments that were from this great bundle as I thought that it would be a perfect fit for what I needed ! I am a huge fan of this font and I am particularly fond of when a sentiment has 2 different fonts in it – I think it adds some subtle interest to the eye! The price point of this bundle is also stellar….just $35.00 now that makes me happy! Remember, we are in full swing of Sale-a-bration so for every $50.00 you spend, you will be able to pick a FREEBIE and YES, I would get this DSP Paper….it is just stunning! To me, I just love black and white with a POP of color! I think that this is just so fun and the fact that I did not have to stamp any of these butterflies is a HOME-RUN in my eyes! The ease of a punch does pay off! I will also share…..type A kicked in for me and I also added a butterfly to the back of each one so when you see the backside of the wings from the side – it will look the same, front to back! It has been a L O N G time since I have used a 3″ X 3″ card and I thought that this would be PERFECT to tuck in the back of tis fun pop up! This is a project that will be able to stay out for anytime of the year and bring a smile to someone. You know what my sweet John said….as I always ask him what his thoughts are once I get done creating….he said – WOW…I do not know how you did that and I said – Well honey…..I did not come up with it, I followed Twila’s amazing directions and then he smiled and then said…..could I have some to give to clients? Oh that John….he is a keeper! Well folks, there you go! I hope that you are smiling and I hope that you give it a try! Below you can click the image and you will get your FREE directions on ow to make this fun project! Have a great afternoon…..John and I are bundling up to go and do the barn and then it is FOOTBALL and I am excited to be inside warm….and playing with paper!!! Don’t forget that if you purchase this bundle from me, I will send you the “goods” to put one together like I made….as after all….you already have the great instructions! You will love making this and you will be so proud of yourself…I know it as I felt the same way when I finished this sweet box! Oh Ellen, I am so sorry to hear about your son. Sending well wishes, hugs, and prayers your way! Oh Ellen my dear – I am sorry that life has been heavy for you. I know that this sweet little box brought a smile to your face….I was so happy and actually quite proud of myself with the end result – it really is not that hard to make! You are so right….and well said – God is great…..hang in there my sweet friend and I hope that each day brings sunshine to you! Beautiful card! The colors are gorgeous and it helps us deal with this “oh so cold” weather. Ellen, hugs and prayers for you and your son. My FAVORITE SHEEP HERDER…..now wouldn’t this be adorable if we could have some 3D sheep…. I just love the fact that a PUNCH will POP OUT THIS BEAUTIFUL COLOR!!!! Talk about easy….. I love this cute, springy 3D project, Susan. Thanks for the PDF instructions. So sorry to hear about Ellen Hinds’ son. I hope you and John did not freeze while out with your animals.Hugs to all. Has this been crazy weather or what! It is what it is and we all know….it will pass! Hi Ann….well….did you make one!?!?! I will say….once you get through making one…you can easily see that making more will be faster and easier with time! I think from a visual aspect – this kinda project looks hard….but breaking it down, it really is not! What I did was go ahead and cut a bunch of the elements out so they are ready to go in an assembly line fashion! Daisey is funny…..but trust me – she is one lucky piggy!!! I saw Twila’s post and thought oh yeah, I have made a couple of those and they were ok. But, seeing your little hoppy frog with his sign and then the little card too, makes me want to try it again. Maybe it was the Hello Beautiful that I didn’t care for as I love yellow gingham. But, the black gingham must be more dramatic looking. Or, could it just be that you made it? Anyway, it is so cute. I hope Sonny doesn’t want to see a pig popping up any time soon. I am still working on New Years cards etc. Cold, I took Teddy out a bit ago and man, it was below zero esp with the windchill and it was in the single digits a few hours ago so who knows what it is now. I don’t want to know. Of course, Teddy thinks we need to go check out everything with all the new snow and new smells. Honestly! I was so happy I took a break from the game to come and check my E-mail as this will be a perfect smile maker to send off to dream land later tonight! So, darn cute. I love that John wants you to make some for his clients too, he knows what it takes to make a card so these must be very special clients! Frosty hugs to everyone! Oh and I need to present the list of frog names one of these days too! You are SPOT ON (again!!!!) as I do agree that the black and white gingham is a GREAT POP factor! You can NEVER go wrong with Black and White with a POP of color!!!! Oh Teddy…..what a SOCIAL BUTTERFLY he is!!!! Did you read about the award that your town won!?!?! Really Really cute !! Plus lucky me …I have all those pretty things coming to my house (in fact they are late …should have been here a couple of days ago. } I think I will get some more of that DSP as my next freebie from SAB . That way I can PUNCH out butterflies `til the cows come home (as my grand daddy used to say } Can`t wait to try this !! Your frog is too cute ,Susan ! How about FRED ? Whatcha think ,Chris ? Healing thoughts and prayers to Ellen`s son !! FRED the FROG it is…..he is just too sweet! The design work of the image reminds me so much of the chick!!!! When I see Football….I ALWAYS think of you!!!! Please make one of these….you will be proud of yourself!!! Hugs and stay warm! OH, beautiful! So springy . . .just what this 16-degree day needs. I m getting so weak in my resistance to add this bundle to my craft room. I hope that you caved and bought this…as it is going on backorder……it is a KEEPER and I to was on the fence about getting it…..glad I did!!!! Stay warm…..and go get crafty! Hi, Susan — Love it, love it, love it! A most-welcome hint of spring when the snow in my yard is knee-deep. Good day to play with paper, my brand-new SU paper share-thank you very much!… Tell Daisy that a gaggle of cats here in Ohio are feeling her pain. Hello me dear……I am going right past that wonderful restaurant we had lunch at today…..each and every time I go in that area my heart beams with happiness as I always think of that special day! I do hope that you will make some of these…they are easy and just bring a smile to your face and heart! So awesome. Can’t wait to try something like this. My short and sweet my head is exploding comment. Boom! Well….hello our PRINCESS! Please make one and blog about it – I know that you will ROCK IT and but that extra special princess spin to it! Love this! New to peeking in…will peek in again! I have made box cards, but this is different! I will take a stab at it! Please do……it is super easy and once you make one…..and then when you stand back and smile….you will be making more and more! Love, love, this card! Thanks for the PDF. I will definitely try this one. I do so enjoy your stories of your animals. Maybe Daisey needs to come visit me in Scottsdale, AZ in the winter months. It’s very warm here. Please post more pics of Daisey & the pups! I miss seeing them. Susan, what a darling box full of fun butterflies and stuff.